Three Weeks Living Aboard - How Did We Power It? I have previously described the electrical specification of K-L as being suitable only for weekends away or for short holiday use, as the previous owner to us, the first, I believe only intended to use the boat as a temporary home on permanent moorings with shore power, selling on when a more permanent address had been found. As such, he didn't invest in a large cruising battery bank or charger when the boat was originally fitted. When we bought the boat, (on a very limited budget), we considered it to be the youngest, least used, and in the best condition for the price that we had seen, even with this slight disadvantage, which, to be fair, can be easily rectified. The boat is fitted in other areas as 'live-aboard', for example the black water tank will last over 4 weeks of constant use, and we can get a week out of the fresh water tank, depending on how long you linger in the shower. See my specification page for full details. As we too only use the boat mainly for weekends away from home, usually on her home mooring with shore power, this suits us fine, and wouldn't justify the cost of re-fitting a large leisure battery bank complete with suitable mains charging systems. But, when we wanted to take the boat out this summer for 3 weeks or more, how did it cope? K-L is fitted with only 2 X 110ah leisure batteries, and 1 X engine battery, charged by the usual twin alternator set-up found on a Barrus Shire engine, 1 X 70ah and 1 X 50ah, working through a Sterling Pro Digital Advanced Regulator. A Sterling 1800 watt inverter converts this to mains as required, and we also have a small Suzuki mains generator from the 1980's with a (small by modern standards) 330 watt output, (it only cost me £50). There are 16 X 15 watt filament lights, which are not used while out and about, other than when getting into bed and using the bathroom. We use a stand light with 3 X 9 watt low energy mains bulbs, that provide ample light for both the galley and lounge area during the evening. From using this, I have found it to be our best option, for light value, even though it is using the inverter to convert 12 V to mains to run it. There is also an Electrolux 12 / 24 volt compressor fridge, that can also be operated on mains via its own specialist local inverter, with an auto change-over. We don't use our normal 26" flat screen mains TV while cruising, instead standing in front of it a small 10" flat screen TV intended for motor home use, working directly on 12 Volts. This also has the benefit of a high gain tuner, so TV reception is never a problem. So the daily routine. If the boat engine is used for 6+ hours cruising, then all systems, TV, stand light, water pumps, Tecma lavatory etc. will happily last for the whole evening, although the fridge has to be turned off overnight. There is also ample power left for the morning after to watch TV etc. over breakfast before setting off, but best to wait until the engine is running until flushing the Tecma the morning after ;-) The macerator uses a lot of power, and runs slow on a less than full battery supply! If the engine is used for less than this, i.e. a short day's cruising, then I will find a suitable mooring where the Suzuki generator can be run. While this is running, it will support all systems, including the fridge and the C-Tek M-100 charger, which boosts the batteries up to float level. A tank of fuel (about 1.5 ltrs) will run for 5 hours, which is sufficient to take us into the evening, where we will again be self sufficient overnight. On two occasions on this cruise we chose not to move on the following day. In these circumstances, the main engine is run for a couple of hours the next day to bulk charge the batteries, followed by the generator to take them to float, while at the same time running the fridge and all other systems. By evening we are again self sufficient. Heating. We have Webasto diesel heating, which could be used while cruising, but would use too much power while idle. We do however, have the benefit of the Squirrel solid fuel stove, which heats the whole of the living space. On this cruise, no heating was required. This has all worked well for us, and although by no means perfect, and certainly unacceptable for live-aboard use, we have enjoyed a trouble free time away from base, with not a single outage of electrical power. At some stage in the future I will change the low energy mains bulbs in the stand fitting for LED, which will equate to running 3 lamps using the energy of just one of the current ones. If, one day, I am allowed to invest the cost, I might just fit K-L with a more normal battery bank and multi-stage charger of suitable size. Until then, as with even the most highly energized and electrically equipped live-aboard, we will have to tailor our electrical equipment use to fit what energy we have available. 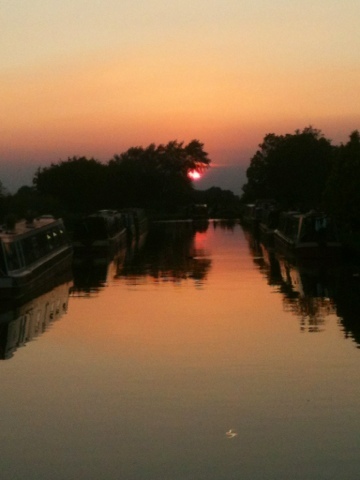 We are now home having just spent the most enjoyable three weeks cruising canals since we have owned our own narrowboat, with good company and fine weather. However, while out and about for that time, and in different locations, we encountered some very strange habits from equally strange individuals. This regular daily encounter, prompted us to run a 'Where's Wally' competition for the most deserving candidate of the day. These, usually from the canal boating community, but not necessarily hire boaters, share boaters or owners, they could belong to any genre, were awarded the daily prize for the most lack of common sense through to straight forward irresponsible behaviour and stupidity. Where shall I start? Could it be the ones who, having left things a little late in the evening to find a suitable mooring for their overnight stay, find all the moorings next to the pub taken, so choose to park up on the lock bollards or the water point, cocking things up for those, like us, who like to be off again before 10.00am the next day? How about the large hire boat crewed by half a dozen young men, who joined the lock queue, disembarked, and then made their way to the lock being operated, (for others in the queue) by two women, (our two women), and happily stand there watching. Or the boat owner, whose own female crew happen to be indoors watching their favourite episode of Deal or No Hunt the Bargain Antique, who just stands by his tiller in the queue while everybody else does the work for them? 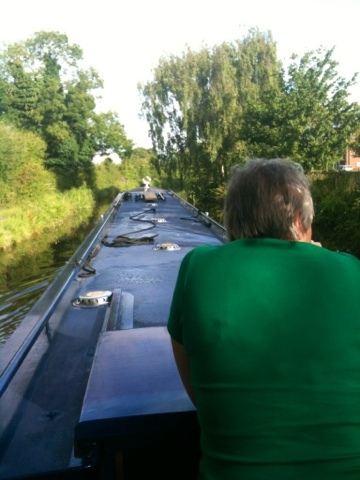 Could it be the hire boat crew, who sat on the water point at the bottom of Kings Lock, hose in tank, drinking tea and eating lunch, watching lock operations at Wardle, the first of The Middlewich Branch. When our turn to lock up came, Margaret set the lock for me, while all I could do was watch in amazement as the hire boat crew rapidly packed up, untied and entered OUR lock! Leaving me stood there jaw dropped with the centre rope up my a**e and Margaret left wondering what the hell just happened! 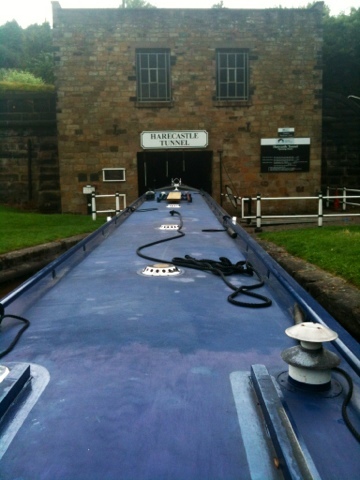 Or the elderly owner who had followed us through Harecastle Tunnel, and then down to Harding's Wood Junction, where the next two locks in the pair were both occupied, and there was one other narrowboat taking up the single lock mooring with very restricted space, awaiting passage. This caused Tom and I to have to 'hover' awaiting our turn for the lock for the onward journey on the Trent and Mersey Canal. Unfortunately, this meant we were also (temporarily) obstructing the entrance to the Macclesfield Canal, which is just prior to the lock. 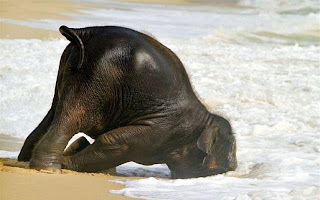 There was nothing that could be done, (other than go for a short trip up the Macc), as there was just nowhere to go. Anyway, this polite old gent shouted across to me, "YOU GOING TO MACCLESFIELD"? To which I quietly replied " no". His response was "WELL GET OUT OF THE BLOODY WAY THEN"! Having manoeuvred, (unnecessarily in my view), into a vacant private mooring on the opposite bank, he then shouted to Tom to clear the way, "THERE ARE TWO LOCKS YOU KNOW". To which Tom quite correctly replied, "yes I am aware of that, but they are both occupied". 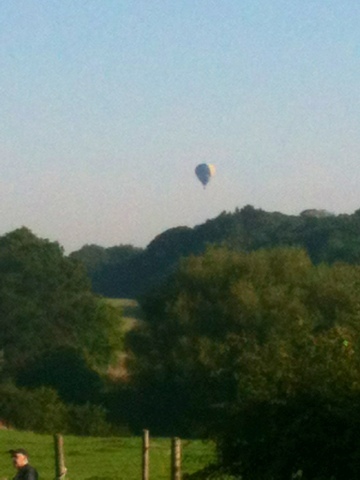 Off he went on his merry way, at full speed - buffoon! Maybe the owner who hovered at a bridge hole to let Waiouru through - so far so good, but then raced off behind him through the bridge hole, causing me, who was in convoy with Waiouru to have to slam things in reverse to avoid a head on, having been informed of another boat, which he could see, and in any case, was already stopped in the water to let Waiouru through. Then there is the hire boat crew who having been told, (twice), by Tom after he safely exited a blind bridge hole, that there was another boat close behind, (us), chose to throttle up and go for it, causing us to meet in the bridge hole, and me to have to take evasive action to avoid an unfortunate meeting. 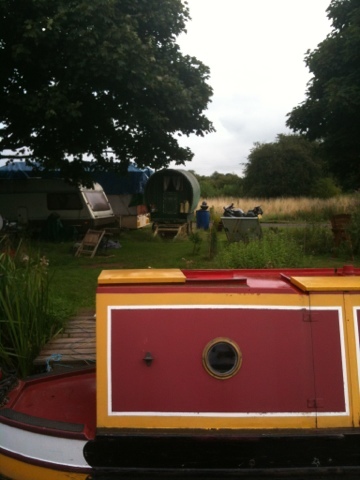 Well, for me, today's Wally is the owner of a small 30 footish narrowboat who we had the misfortune to meet coming in the opposite direction close to Swanley Marina. A bush / tree had fallen into the cut, causing an obstruction on a bend, both visually and to the room available. 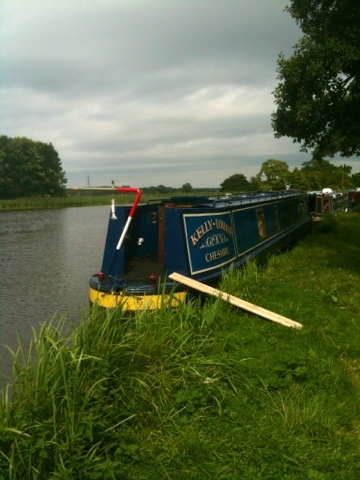 To make matters worse, a hire boat, obviously crewed by Wally's brother, had chosen to stop for lunch just prior to this restricted section of canal on the bend. I slowed right down to tick-over on the approach, having no view, and sure enough, just as we were about to round the bush, there was Wally, full throttle towards us, complete with bow wave, having obviously just lost his water skier in the last bridge hole. There were two walkers on the tow path, who had seen me waiting at a stand still in the water, but by now blocking through passage due to the moored hire boat combined with the fallen bush. They started to wave and shout frantically at Wally, but to no avail. He shot past us at break neck speed, as I did a 'flip' around the bush using bursts of throttle combined with full rudder, one way then the other. He missed us, but not so fortunate I think for the hire boat, after first bouncing off the armco banking. Bloody idiot. Here we are, on the last country moorings provided by the Shropshire Union Canal Society on the Middlewich branch, of that canal at Cholmoldeston, (pronounced Churmston), between bridges 4 and 5. We have a very short hop to our home mooring tomorrow, but wanted to leave ourselves plenty of time to clean the boat out after living aboard for the last three weeks. 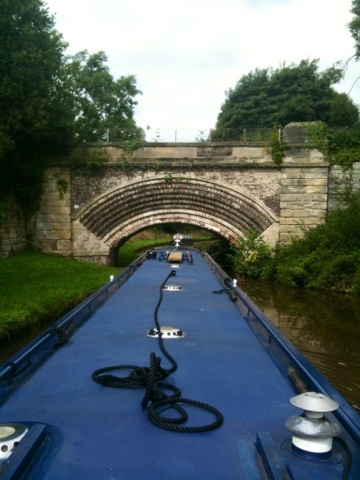 The ring is a round trip of 114 miles, 102 locks, 36 small aqueducts and 2 tunnels, (Cowley and Harecastle). 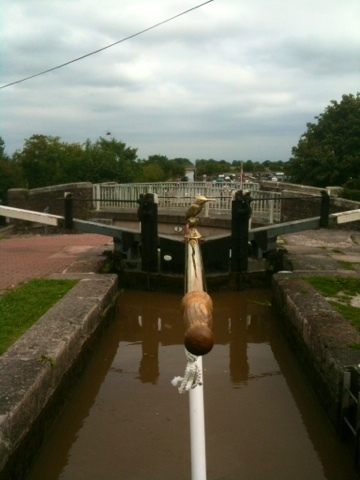 The trip will take 63 hours of cruising time, not counting hold ups, such as those we encountered at a couple of locks. This equates to 9 days at around 7 hours a day, although we chose to make a more leisurely trip so we could have relaxing days with time to look around places of interest. The four counties visited are Shropshire, Staffordshire, Cheshire and West Midlands. 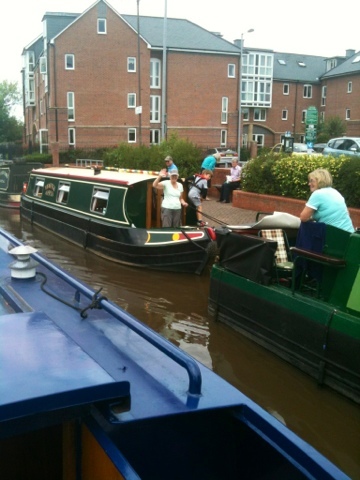 We say farewell to Tom and Jan at Barbridge Junction, as they head to Chester. Back to real life for us tomorrow. 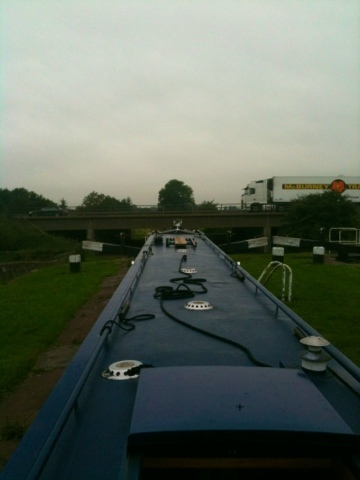 We landed in Middlewich around lunchtime after a fairly trouble free run through 14 locks over around 8 miles, starting at around 7.30am. 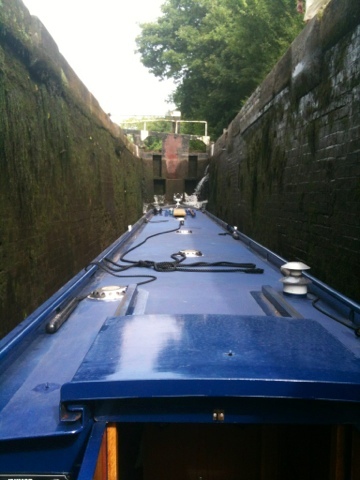 The trip was made easier as many of the first locks encountered from Hassall Green are paired, and with two boat crews, can be handled very efficiently. 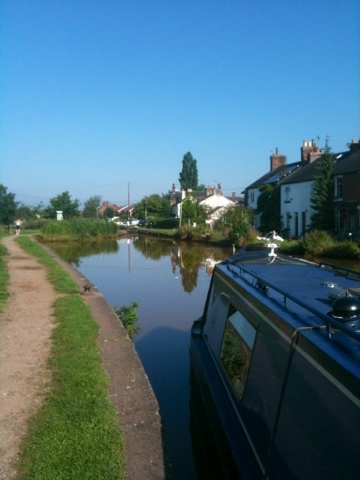 Now I am aware that many of the images are of the boat, as will be the one later here of our Middlewich mooring for the night, opposite the famous fish and chip shop, which we have tried and loved in the recent past, and intend to do the same tonight. But first are what I think are great images, as far as an iPhone photo goes anyway, of last night's sunset and this morning's sunrise. If you have ever travelled south on the M6 motorway through Cheshire and noticed canal locks on the left hand side, here is the same location viewed from the canal. 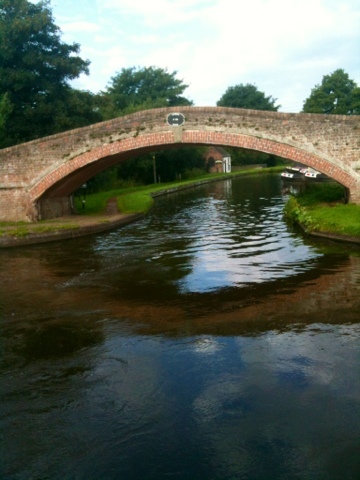 The M6 passes right over the canal here. 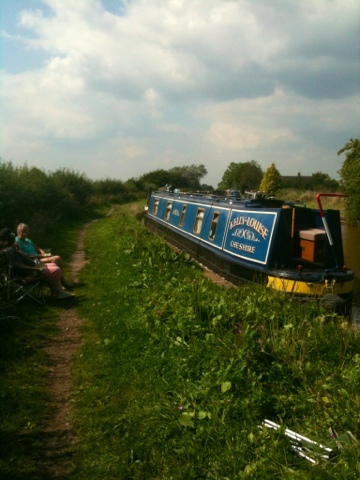 Finally, as promised, the picture of the boat on our Middlewich mooring. It is easily possible to complete the trip to our home mooring from here in the day, but, as usual, we intend to take it easy and do it over two, and we are sorry to say, that will be where we say Bon voyage to Tom, Jan and Waiouru, whose company we have so enjoyed over the last couple of weeks or thereabouts, as they carry on their canal adventure, and we return to reality. Today we have made our way to Hassall Green for an overnight stay, arriving in time for lunch and on good ringed moorings, leaving us ready for our run into Middlewich tomorrow. 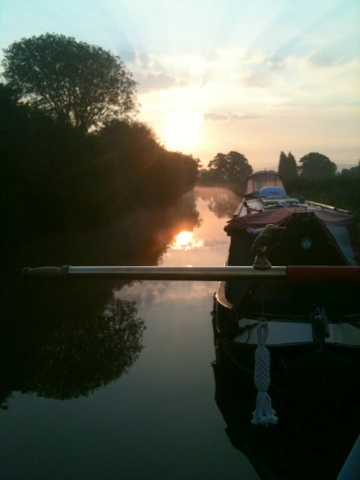 The timing also ensured our choice of mooring, and we have now been joined by other boats. It also means we have a relaxing afternoon ahead of us in lovely warm sunshine. We will get the garden chairs out with the chilled lager can tucked in the pouch shortly. Tomorrow's forecast is for similar fine weather, but may be a little cooler due to slight cloud cover, which will suit us as there are many locks on that run. 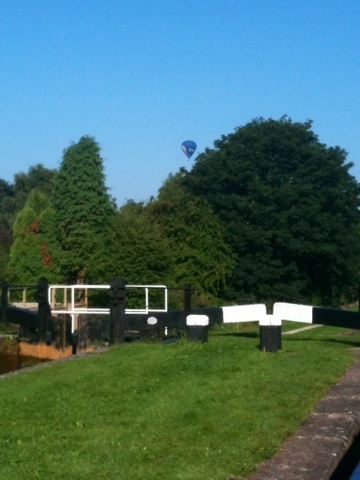 This morning at dawn the canal was covered in a white, low lying mist, which cleared to blue sky and sunshine, with a hot air balloon flying past us. Not much to report today. 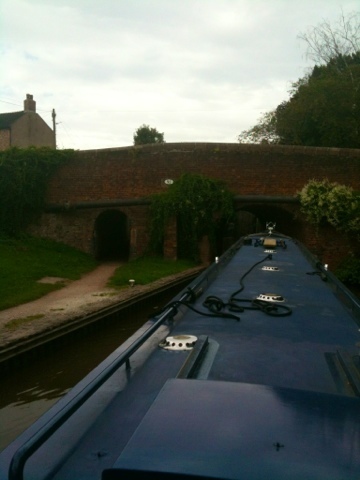 After a lovely evening meal and drinks with Tom and Jan at the Red Bull pub last night, (Thai red chicken curry for me), we have moved off our overnight mooring in Kidsgrove which was handy for Tesco, but a little built up. 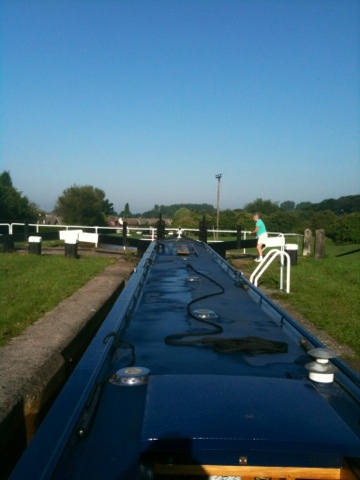 We have made a short hop this morning through four locks to the village of Church Lawton and open country moorings, calling at Red Bull Services to top up the fresh water tanks. The weather today is developing to become fine and sunny, ideal for a lazy Sunday afternoon. 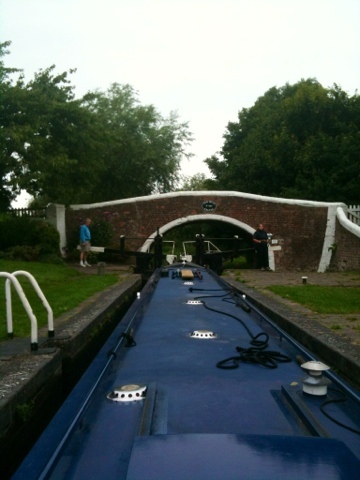 Tomorrow we hope to complete the remainder of the Cheshire Locks, better known as 'Heartbreak Hill', before making for Middlewich on Tuesday. Due to the very short run today, we are both utilising our mains generators to top up the battery banks ready for the evening. Today's journey was short but exciting. Neither of us has been through Harecastle before. I had planned to in the 1970's, but the week before our trip, when leisure boating on the canals was very different to how it is now, the tunnel collapsed and remained closed for the next 5 years whilst its viability was assessed before its repair, which included removing the towpath to enable increased headroom and ease passage. First we passed through the last of the potteries, passing the Royal Doulton factory, as well as Middleport, where Burleigh Ware is still produced. There were also some building relics to study on the way past. 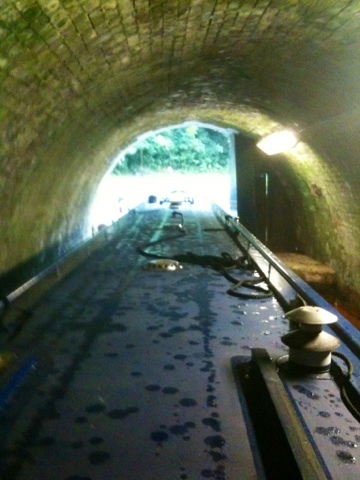 The tunnel is now manned, and equipped with a crewed safety boat just in case. On arrival a C and RT staff member meets you to take boat details and give a quick safety briefing. And after a short wait for south bound traffic to complete their transit it is our turn. As you enter the southern portal airtight gates are closed behind the last boat in, then huge extractor fans are turned on to make motor boat passage possible without suffocation. 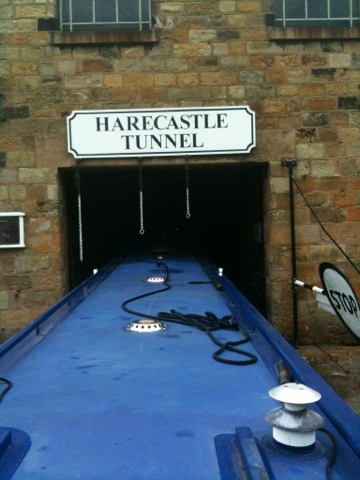 The tunnel in use today is the more modern early 19th century one, built over 3 years by Thomas Telford. 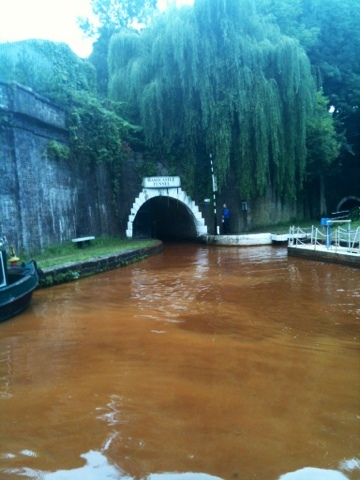 The original 18th century tunnel, built by Brindley is now disused due to subsidence. 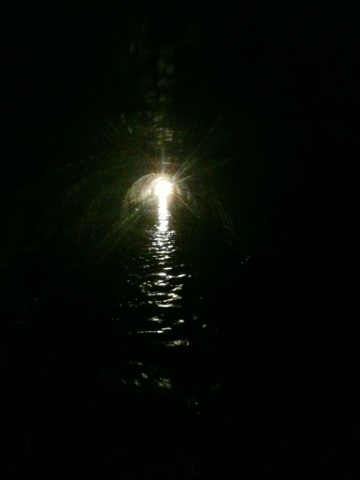 The tunnel is just shy of 3km long and around 12 foot wide now there is no towpath to contend with. Headroom in places is below 5' 9", with water pouring from the ceiling in places. The passage is also done in pitch darkness with only the boat headlamp for illumination. Up until around 1914 horses could be used through the modern tunnel as there was a towpath. the old Brindley tunnel had to be 'legged'. Then, up until 1954, traffic was towed through using an electric tug. 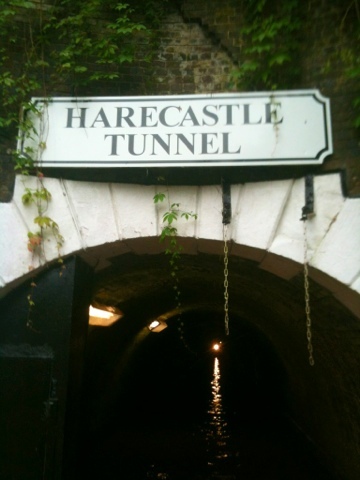 In 1954 extractor fans were installed so diesel powered craft could now use the tunnel, as it is today. The 1973 collapse could have put paid to it, but luckily the powers that be decided to fund its repair. A very interesting experience. This is the lamp of the following boat. After 40 minutes underground the exit portal appears ahead. Looking back from where we have just been. We then did the one lock at Hardings Wood Junction, now in pairs, before mooring for the night just prior to Red Bull flight, which will be the start of tomorrow's trip. Locking down simultaneously side by side, taken from the cockpit of K-L.
After yesterday's delays we again decided to get an early start at 7.30am, although three others had done the same before us and for the same reason. 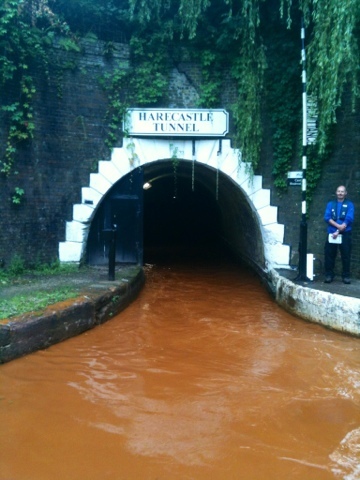 I have now discovered the reason for yesterday's delay at Aston, which then caused ongoing problems. Apparently a boat handling instructor spent 45 minutes in the lock with his client. Hmmmmm! 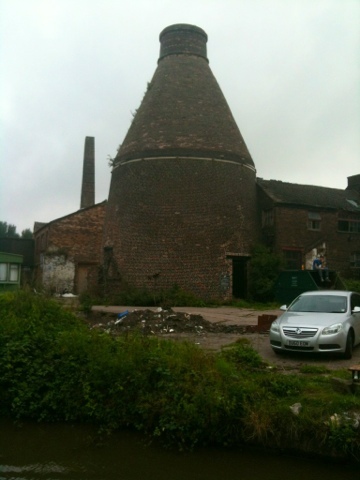 Today we chose to motor straight through Stoke on Trent. 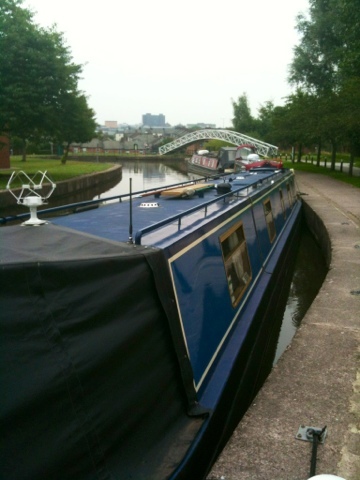 I don't particularly enjoy urban landscapes, although there is much interest around the canal corridor. 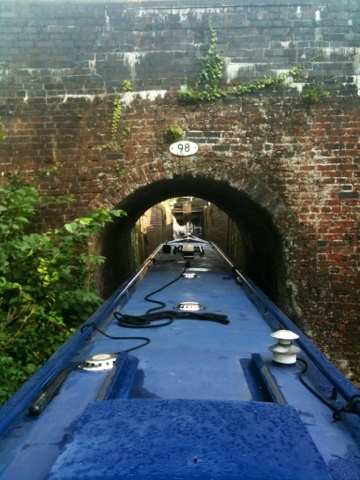 We encountered some very deep locks, some with narrow entrance tunnels, others with very low railway bridges at the entrance forcing me to duck right into the cockpit in order to pass under. 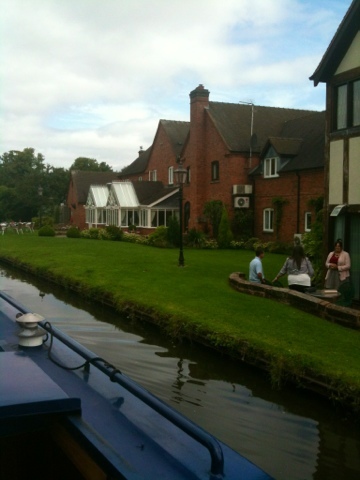 We decided to stay the night at Etruria, where Josiah Wedgewood built his factory and residence adjacent to the canal. He was closely involved with the routing and initial planning in the late 1700's, as he saw it to be an ideal mode of transport for his fragile pottery wares, much more efficient than pack horses, which were the only other alternative at that time. 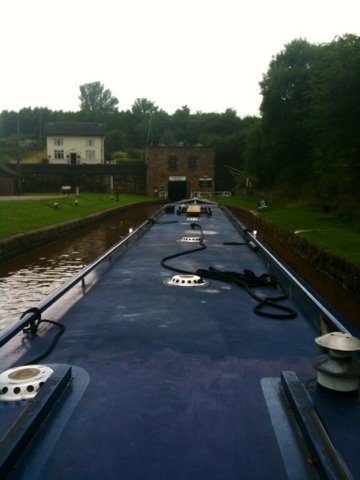 In fact we are actually now on the Caldon Canal, having reversed 200 metres or so into it's entrance and the ringed 48 hour moorings beyond. 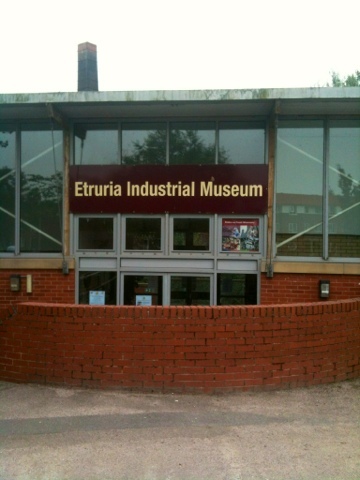 Directly adjacent to us is the Etruria Industrial Museum, which, unfortunately is currently closed. 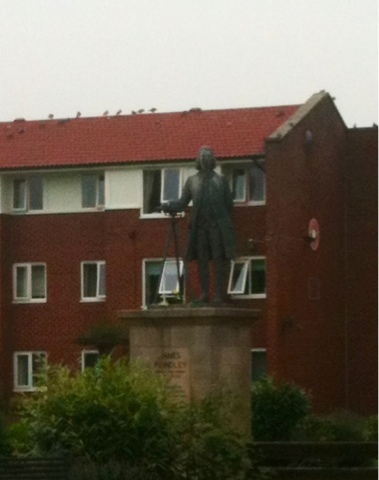 On the other side of the canal is a fine statue of James Brindley, engineer in charge of the building of the canal. 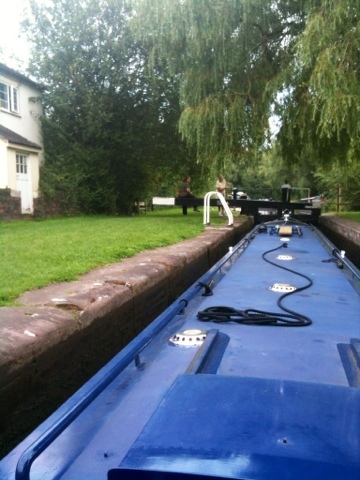 And next is tonight's mooring. A little curved, but again perfectly acceptable. ....And now ahead of our schedule. The reason for this is that having been held up a while at Aston Lock we arrived in Stone around lunchtime, and mooring availability for our overnight stay was zero, so we had to continue up the locks until we found something. 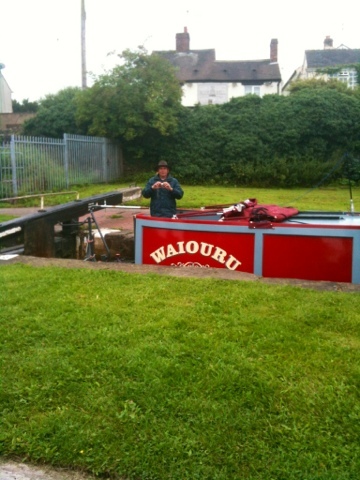 We finally found two vacant moorings just before Stone top lock. They are slightly curved, but quite acceptable, and we are set for our onward journey tomorrow. Shopping at Morrisons nearby has just taken place, with a look around town thrown in. We have never been here before, and it appears to be a pleasant little place. 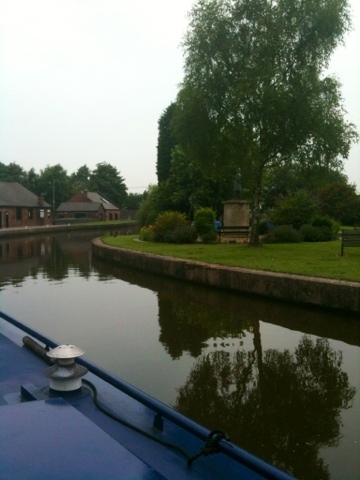 Leaving Great Haywood Junction to join the Trent and Mersey Canal. A genuine Romany traveller's van in the field. A very substantial arched road bridge. 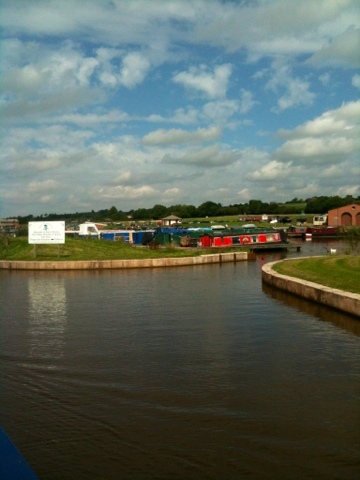 Passing Aston Marina, just before the lock that delayed us today. 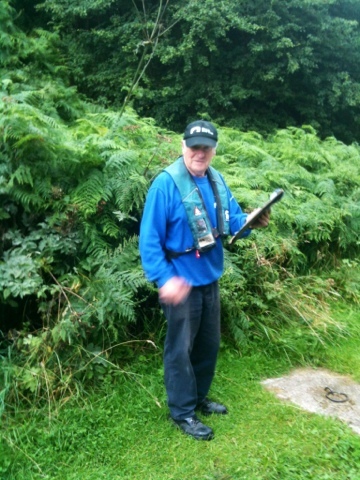 And just for Carol and Jeff in Anglesey, look who we met as we passed through Stone. Margaret and Rob send their best wishes! A small world. 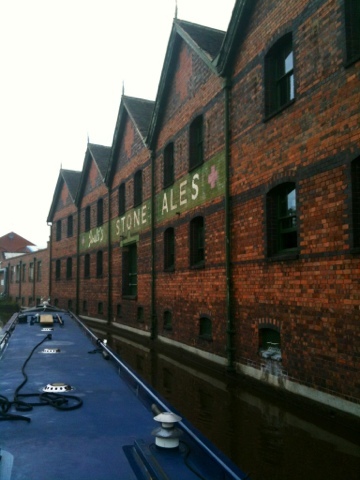 Almost there, passing the Joules Wharf brewery. 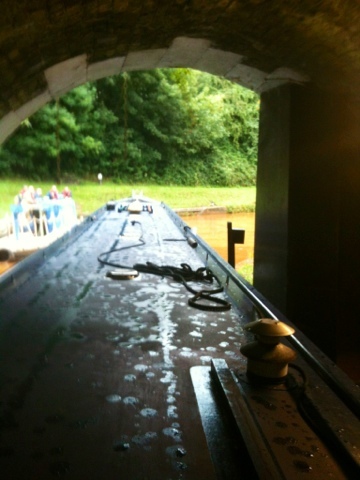 And this is the entrance to our last lock of the day, we are moored just at the top. Note the horse tunnel left over from the days of horse boats, to the left of the boat entrance. Unlike Tom and Jan, unfortunately we have time constraints attached to our cruise, with a 60th birthday party to attend at the end of the month. As such we have a schedule, and as a result of a good day's cruising today, we are back on it. 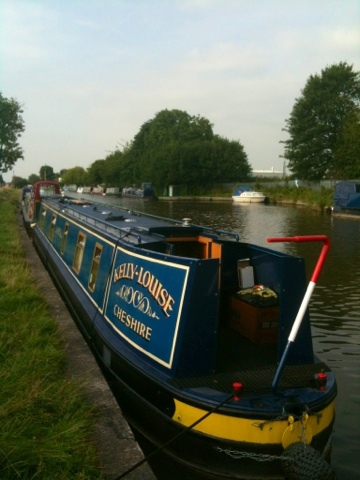 We departed our Gailey mooring around 7.00am and managed to get off while the rest were still thinking about it, in particular the hotel boats who we passed still moored in Penkridge after their overnight stay. 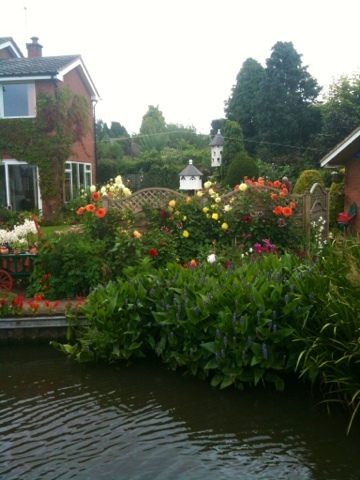 We have passed through some really pleasant places on our way, with some beautiful canal side properties and rural countryside. However the condition of the canal has room for improvement in places with passage narrowed by weed, and quite shallow in places. 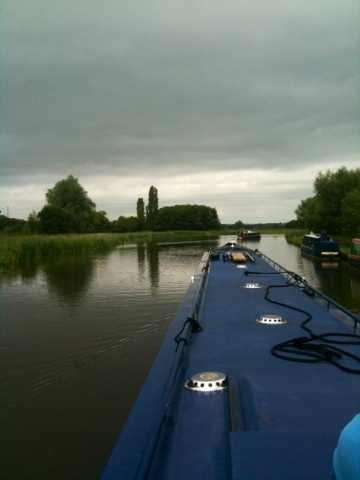 We passed two 'Black Prince' hire boats who were travelling together. 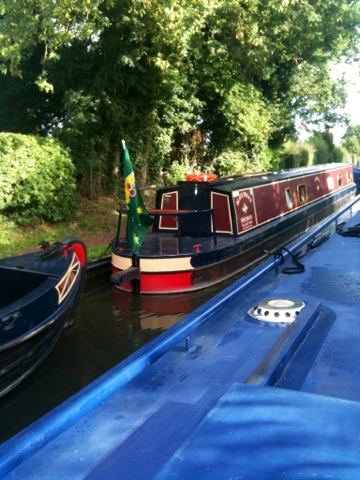 The flags displayed from the stern indicate that they are Australian visitors enjoying a holiday on the canal. 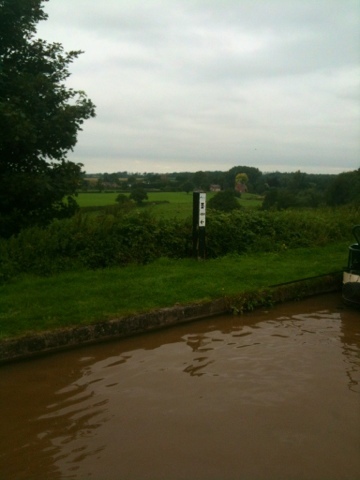 We have managed all the way to Tixall Wide for our overnight mooring, arriving here about 2.30pm. When the canal was built, in 1771, the landowner whose land it would cross insisted that it be landscaped to have the appearance of an ornamental lake to be in keeping with the rest of the gardens that were designed by Lancelot 'Capability' Brown. I believe they succeeded. Tixall Gatehouse, built 1580, all that is left of Tixall Hall Estate. Margaret has gone for the short walk to Great Haywood for a look around. 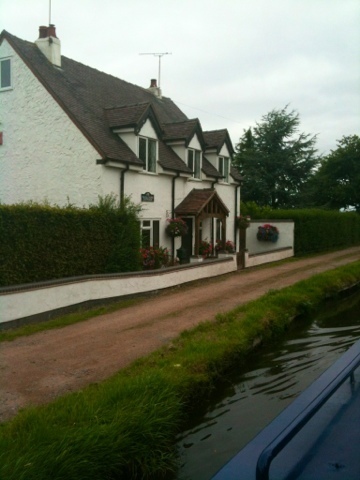 This is the location of the junction with the Trent and Mersey Canal, which we will join tomorrow for the next stage of our cruise. 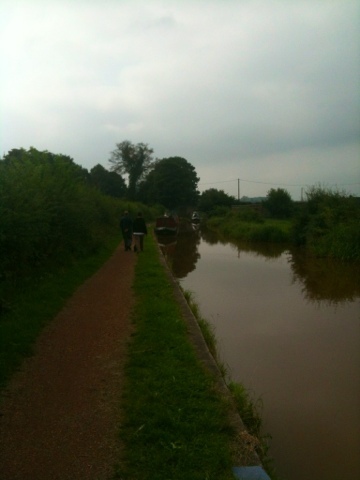 Nearing The End Of The Shroppie. 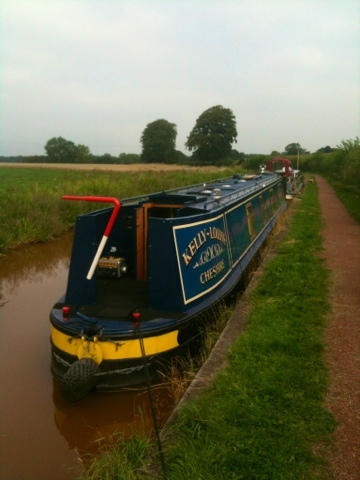 A Familiar Boat Has Arrived At Our Mooring. Check Out These P+O World Cruise Prices for 2014!